The world's most trusted dictionaries. 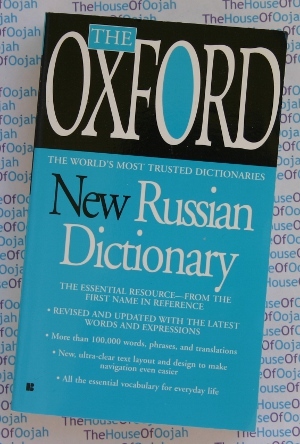 For language students, translators, students of Russian literature, or anyone that needs to look up some Russian from time to time, this new edition of the Oxford Russian Dictionary is now revised & up-to-date. With both Russian-to-English and English-to-Russian sections, more than 100,000 words and phrases provide a wide breadth of information. Notations for colloquialisms, adjectives, nouns & verbs included. Written examples of Old East Slavonic are attested from the 10th century onwards. Today Russian is widely used outside Russia. Over a quarter of the world's scientific literature is published in Russian. It is also applied as a means of coding and storage of universal knowledge � 60�70% of all world information is published in English and Russian languages. Russian also is a necessary accessory of world communications systems (broadcasts, air- and space communication, etc). Due to the status of the Soviet Union as a superpower, Russian had great political importance in the 20th century. Hence, the language is one of the official languages of the United Nations.